Deep in the heart of downtown Garland's Zion Gate recording studio, 1121 band members Tracy Kornet and Tommy Hiett, and chief engineer Brance Wages put the finishing touches Tuesday on a Christmas song benefitting the Happy Hill Farm music program. 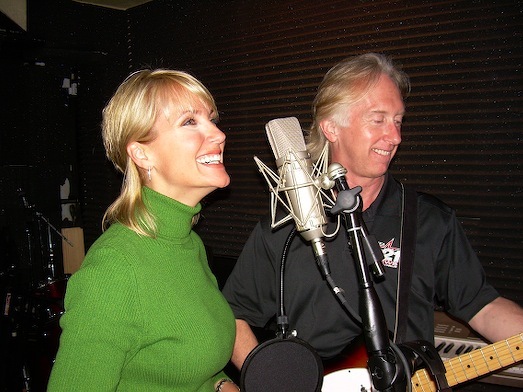 Lead singer Kornet, who otherwise anchors newscasts for TXA21/CBS11, co-wrote "Around This Time Of Year" with Hiett, 1121's lead guitarist. A group of teenage singers from Happy Hill Farm earlier packed Zion Gate to provide backup vocals. A $1,000 charitable contribution from Stratos Global Greek Taverna, during the band's appearance at the July 19th Uncle Barky Show, went entirely to Happy Hill Farm's music program. It also inspired the band to take this next step with a Christmas-themed single, Kornet said. Plans are to release "Around This Time Of Year" before Thanksgiving Day, with downloads available on cbs11tv.com. All proceeds will go to Happy Hill Farm's music program. Zion Gate has donated all studio time to the project. We'll update you when the single is available for purchase.